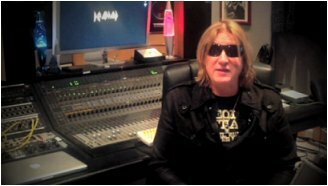 Def Leppard singer Joe Elliott has filmed a new video advert for the 2013 VIVA Hysteria! residency in Las Vegas. The VIVA Hysteria! residency kicks off in 64 days on 22nd March and the 9 show run ends on 10th April. Vivian Campbell has told fans in recent months that the band will be recording the shows for a possible CD/DVD release. For all the latest news on these shows visit the 2013 Tour News section. Watch the video below courtesy of defleppardofficial which features Joe in front of the mixing board at his home studio in Dublin, Ireland. "Hi Joe Elliott here to let you know that Def Leppard are gonna be in Las Vegas starting Friday March 22nd. Three shows a week for three weeks performing VIVA Hysteria! with a few choice cuts from our back catalogue thrown in for good measure." "So I hope you can join us for one of the shows. Come to them all, we'll be there."